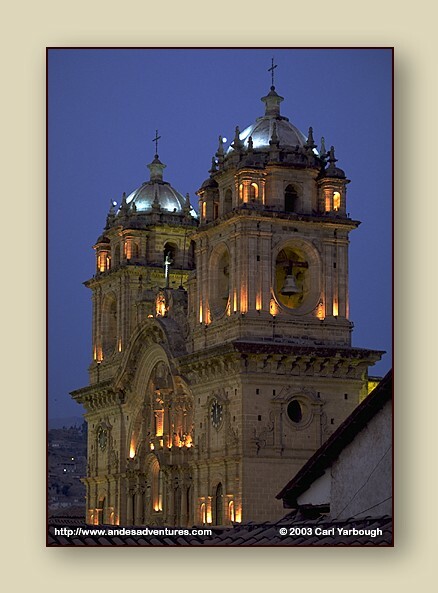 One of the most ornate churches in Cusco, La Compania (The Church of the Company of Jesus) was commissioned by Jesuit priests in 1571. Designed by architect Don Francisco Becerra. Work began in 1576. Severely damaged by the estimated 7.2 magnitude earthquake of 1650, reconstruction was begun in 1661 and completed in 1668. The facade and towers were designed by Jesuit priest Fructuoso Viera. The architect was Diego Martinez de Oviedo. The main floor is in the shape of a cross with one broad nave and two towers with circular windows. The transept ends in a Baroque style cupola (spherical ceiling). Several of the cedar altarpieces are gilded with gold. Historic paintings include the depiction of the wedding of Spanish Captain Martin Garcia Oñas de Loyola and Clara Beatriz Qoya. The groom was the nephew of Saint Ignatius of Loyola, and was the captor of the last Inca Tupaq Amaru I. The bride was the daughter of Sayri Tupaq, the niece of Tupaq Amaru. Artwork includes canvases by Marcos Zapata, Basilio Santa Cruz, Basilio Pacheco, Cipriano Gutierrez and Rivera. In the Sacristy are sculptures by Melchor Huaman Mayta of the saints San Jeronimo and San Francisco. La Compania partially occupies the site of the Amaru Kancha, a palace of Inca Huayna Capac. It is located on the southeast side of Plaza de Armas.